Between Groupon and Living Social, it seems that the golden age of The Deal has arrived. It’s not just fancy restaurants and hotels slinging their wares for deep discounts. Now it seems Nissan is getting on board, too. Redesigned for 2013, the compact Sentra comes across like two cars for the low, low price of one. A claimed weight reduction of up to 150 pounds excites people who remember when Sentras were sporty, fun little cars. Buyers simply looking for a comfortable, affordable runabout will appreciate the soft, cushy seats as well as rear-seat legroom now among the best in class due to the new car’s additional 0.6 inch of wheelbase and 2.3-inch increase in overall length. A roofline that maintains competitive rear headroom before sweeping gracefully back to the trunklid imparts both outward visibility and style. And all buyers will appreciate an interior that, 10 years ago, would have seemed at home in an Infiniti. There are few straight lines anywhere, and certain parts—such as the door handles and their bezels—give the impression that a truck bound for an Infiniti assembly line got lost on its way to the factory and deposited its load instead at a Sentra plant. As much as the Sentra feels like two cars in one, though, both feel half-baked. It’s said to be lighter, but our test unit was merely two pounds less hefty than the last Sentra we weighed—and it felt less structurally sound. The ride is too firm for people who don’t care about driving, but the level of body roll will disappoint those who do. The seats are comfortable, but lack even the slightest hint of lateral support. Fortunately, the cornering limit is just 0.81 g. Steering weight builds linearly, from dainty on-center effort to relatively manly resistance at the adhesion limit—people who don’t like cars will think it’s too heavy—but the rack lacks the ability to self-center. Combine the need to manually return the wheel to straight ahead with this much body roll, and the Sentra’s steering feels like the drill sergeant for a fat-guy platoon, issuing orders to recruits who simply cannot keep up. The Sentra’s awkward exterior styling, too, seems indecisive, as though half the design team were making an attractive small car and half were making a miniature Altima. The result is almost handsome. Call it adolescent-elegant. When it grows into those oversized head- and taillights it may look better. 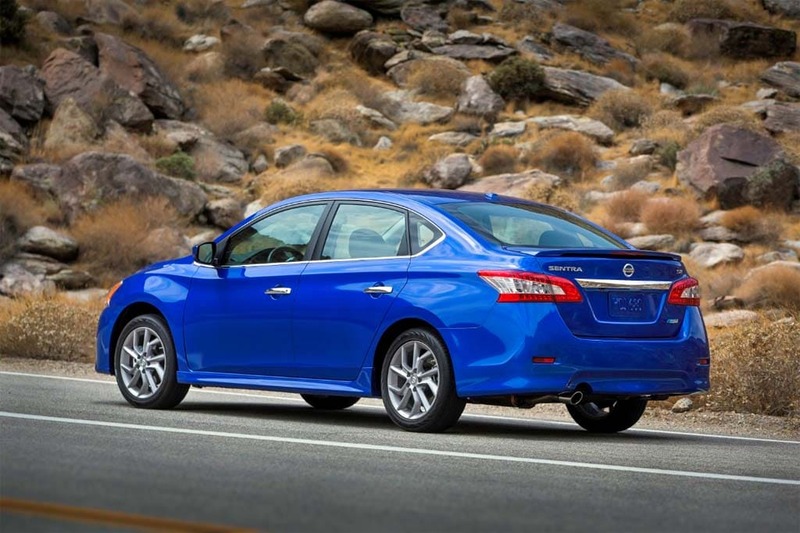 At a starting price of $16,770, the base Sentra represents a savings of $440 over last year’s car. Loaded up with heated front seats, a sunroof, navigation, and a rearview camera, the uplevel SL example we tested still costs less than $24,000. Those fancy LED-accented headlights and LED taillights? They’re standard. Sure they’re ritzy, but the trend toward outsized lighting elements has us wondering when designers will learn that styling embellishments such as these are things we’ll be ashamed of someday soon. Remember fender vents? And remember focusing on one design theme? Combining half-baked with twice-baked just isn’t the same as well done.